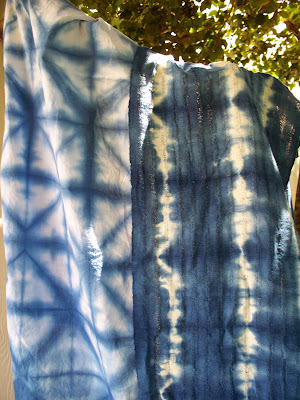 Yesterday, the local group of Surface Design Association held a trial run for an indigo dyeing day which is to be held at the Center for Contemporary Craft as their next Hands On Houston (Sep 6th). Several of us from the group did some practicing, made some samples and did some personal dyeing. After I made a couple of samples, I dyed a couple of scarves for myself. Now I have some wonderful blue pieces in my wardrobe. I do love playing with indigo. Just not brave enough to set up my own pot yet.